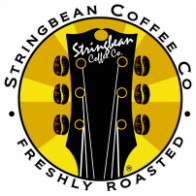 Series two of design - two t-shirts and two posters (11x17), the bass player and astronaut designs for Stringbean Coffee, Includes illustration work, type treatment, emailing design proofs/versions, formatting files, proof checks, test prints at size, etc. Finished creative will be yours. 20 total 11x17 prints (10 of each design) on a nice, uncoated off white sheet = $40 printing cost. * 20 was the quantity they wanted to hit.